Assigning an email is easy! Click on the Assign icon on your email or, on the Options menu "...", select Assign to me or to colleague. When the modal displays, type your colleague’s name (if you are assigning the item to yourself, type your own name) and select them. 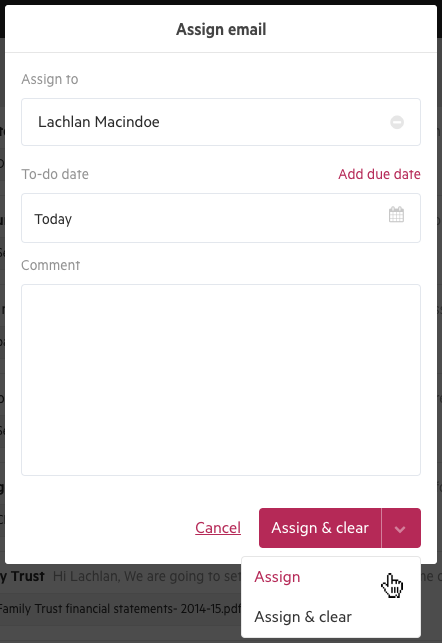 You can also add a To-do date to indicate when the email should be actioned and a due date if there's a deadline. Select Assign & clear if you wish to clear the email from triage immediately. Once you assign an email, the assignee details will display when the email is collapsed. When you expand it, you will see an audit trail with the assignee details, and your colleague will receive a notification of the assignment in their Triage. Now that this email has been assigned, it will exist in the assigned person's to-do list to action later.